Archive image by Abahlali baseMjondolo. South Africa: “We are all amaMpondo!” Abahlali baseMjondolo will this morning approach the Durban High Court on an urgent basis to apply for a Spoliation Order against the eThekwini Municipality. Submitted to Enough is Enough. Image: Archive image by Abahlali baseMjondolo. On Friday at about 10am the notorious eThekwini municipal Anti Land Invasion Unit descended on the Barcelona 2 ‘transit camp’ (amatini or government shacks) in Lamontville and violently and unlawfully evicted the residents from the disgraceful ‘transit camps’ that there were forcefully imposed on them seven years ago for the FIFA World Cup. The residents were told straight on their faces that they are amaMpondo and that they should return to the Eastern Cape. This is not the first time that people from the Eastern Cape have been openly discriminated against by high ranking politicians and officials in Durban. This is a dangerous politic that continues to tear apart all the gains made by our democracy. The ANC is creating a very dangerous situation in which impoverished people are forced to fight amongst one another. When Xhosa speaking people are removed from the tins at gunpoint, and Zulu speaking people are then brought into the tins, there is a very high risk of serious conflict. Our position as Abahlali is that we are all amaMpondo and we are all amaZulu. A neighbour is a neighbour and a comrade is a comrade. We will continue to build unity in the neighbourhoods, and in struggle, and we will continue to oppose the politicians that are trying to divide impoverished people. We call on all traditional leaders to condemn the conduct of the ANC in eThekwini in the clearest and strongest terms, and to reject this attempt by the politicians to divide the people. At the same time as the ANC and the Municipality are playing a very dangerous game of trying to divide impoverished people the ANC Mayor Zandile Gumede and the Chief Whip Nelly Nyanisa have given public permission for their councillors, their ward committees and BECs and the police, the Anti-Land Invasion Unit and the municipal security to attack our movement. 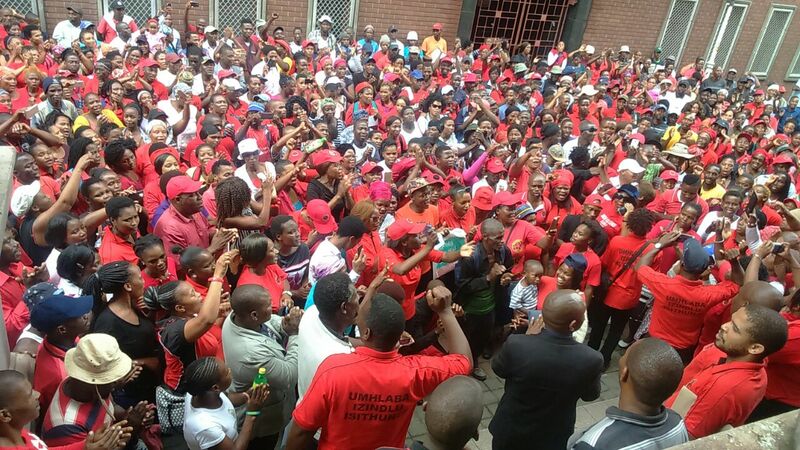 They have vowed to “deal with Abahlali”. We call on the Mayor, Nyanisa and all those who think that the public can measure their leadership by attacking the landless and homeless who are already impoverished and vulnerable to withdraw their discriminative and ethnic tendency. There can be no place for this regressive politics in a democracy. We reiterate our warning to the Mayor and those who use violence, death threats and even death to govern that if any of our leaders, including S’bu Zikode, are attacked we and the general public will not hesitate to hold them accountable. We are hoping to meet the Mayor in court this morning to prove that her attack on Barcelona 2 is lawful. However, we note with serious concern that this municipality has never at any stage conducted any eviction in terms of the law. In other cities court orders are obtained before an eviction. However, the eThekwini Municipality is a rogue municipality that operates without regard for the law year after year. We note that on Youth Day some young people in Durban were reeling from an illegal and violent eviction perpetrated by the ANC that left some injured, and many more homeless. We are determined to protect lives of the impoverished and to uphold, promote and protect the Constitution of the Republic of South Africa as an important line of defence against the gangster politicians in the eThekwini Municipality. At the same time we are determined to continue to build the democratic power of the oppressed from below and in struggle. South Africa belongs to all who live in it. All people shall have the right to live where they choose, be decently housed, and to bring up their families in comfort and security.